It is a not so complicated issue if you get your iPad data backed up to iTunes but stuck to restore iPad data from iTunes backup. There do exist several ways to restore iPad from iTunes. And the article will show the most common and useful two ways to restore iPad with iTunes. Go on with it to get what you need. This way is recommended by Apple and it is the most widely used procedures to restore iPad iTunes backup. It will get the whole backup back on your iPad, including all the setting and data. Just see how the following steps restore your iTunes backup. Connect your iPad to the PC or Mac which you have stored your backup. Open iTunes. BTW, if there’s a new iOS version, just update it. Go to File > Devices > Restore from Backup. Check all the available iPad backups and pick the most relevant one. Click restore and wait for the process to finish. Your iPad will restart and then sync with your PC or Mac. Wait it to complete. Pretty easy to perform, right? But you should note that this way has some disadvantages. If there are new data on your iPad, they will be overwritten. You cannot restore part of the iTunes backup. Once you restore, the whole backup will be downloaded. Sometimes it consumes long waiting times for restoring the whole backup. iMyfone D-Back iPad data recovery for Win and iMyfone D-Back iPad data recovery for Mac help in restoring iPad using iTunes and owns attracting functions to perform iPad data recovery. 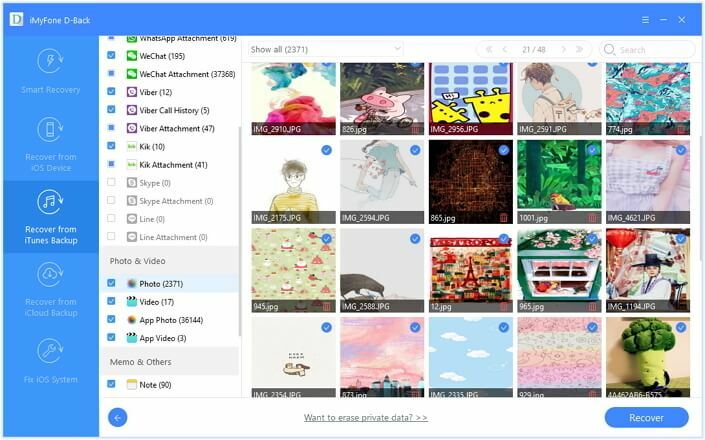 Recover 22 different File types, such as iMessages, Contacts, Notes and more. 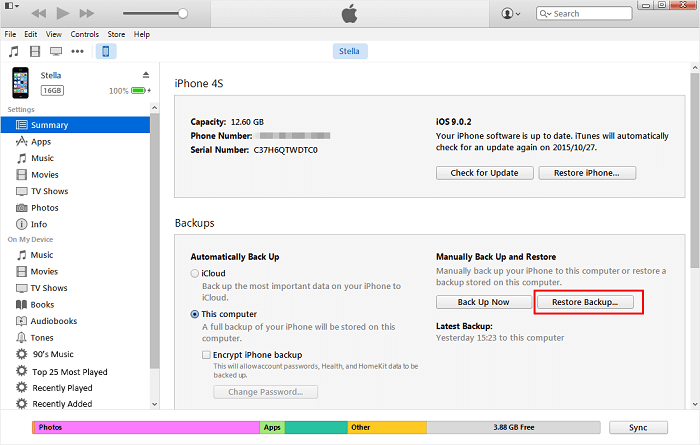 Besides iTunes, it supports restoring data from iCloud backup and iPad directly. Displays preview of recoverable files so that users can confirm what they need. Provides free Trial version to allow uses to try out Before purchase. Availability of selecting needed files instead of restoring the whole backup. 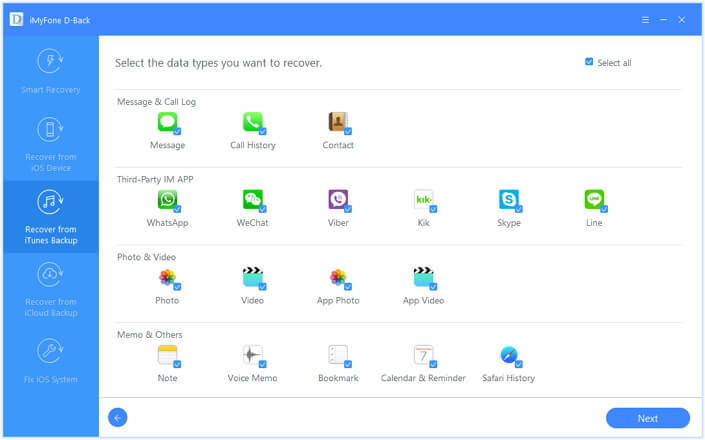 Also recover third-party apps such as WhatsApp, WeChat and Kik messages. Step 1 Choose the File Type(s) You need. Run the program and from “Recover from iTunes Backup” tab, click on “Start” button to mark the files you want to restore. You can choose only some of them or all the options. Step 2 Choose Most Relevant iTunes Backup to Scan. 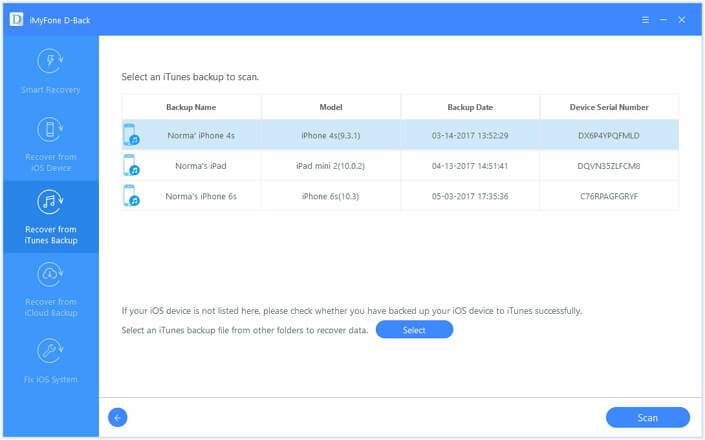 iMyfone D-Back will list all the iTunes backups on your PC or Mac. According to the backup date, choose the most relevant one to scan. After scan, the scanning result will be displayed on the interface. Preview all the recoverable files and click on Restore to choose one recovering path. And your iTunes backups are restored, without wasting too long time! Are you drained of running through multiple steps in restoring iPad data from iTunes? And now, iMyfone D-Back for Win and iMyfone D-Back for Mac should be your precise choice to restore iPad data from iTunes conveniently. Remember that the free trial version is offered for you to detect your data on iTunes backup. Just download it to have a try! Does iTunes Backup Deleted Text Messages? How to View Them? How to Access and Extract SMS from iPhone Backup? How to Transfer iTunes Backup to Another Computer?